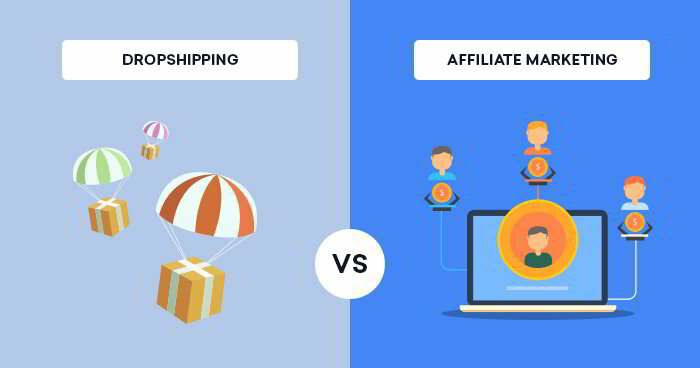 Dropshipping E-Commerce vs Affiliate Marketing, Which is Better? Looking to make money online and wondering which business is better? Affiliate marketing or drop shipping for a living using e-commerce store? what’s easier for a newbie? which business has more stability? if I had a magic wand to create a 6 figure business, which would it be? Both business model has its advantages & disadvantages, on the surface they may look similar, but they both have a stark difference in how you go about building the business & what it takes to make the business successful. With Dropshipping your profit is determined by you. How much you price the product & how you manage your expenses. With Affiliate marketing the profit margins are usually too small for you to run paid advertising and still be profitable. So the preferred method to marketing affiliate marketing is using SEO (Search Engine Optimization) basically ranking a website in Google and getting free traffic. This can be pretty challenging skillset to master. With Dropshipping, the profit margin of 20% is high enough for people to successfully run paid advertising campaigns. Although it’s not always successful, a lot of it depends on finding a winning product. But once you do, you can do really well. Since its paid ads you can scale much faster as well. What could be the downside of the drop ship business? many products do not work & will not be profitable. The challenging part of this business is to pick the right product and this can take time. With affiliate, you don’t really have to worry too much about product selection. Despite many of these challenge points, many have managed to be successful with E-Com business. You need to be someone that’s patient and that’s got some money to spend in testing different paid advertising such as FB ads or Adwords. Be prepared to spend some money without seeing any return on investment in the beginning. Some people hit it out of the park their first go, but this is a rare case. Most need to test out several products before they find one that’ll be profitable. For Whom is Affiliate Marketing Most Suited For? To make good money as an affiliate, you need tons of traffic. Since your commissions are usually 15%, you would need free traffic. If you use paid traffic, you may hardly make any money after the adcost. To get free traffic you need to compete with thousands of affiliate marketers out there that’s trying to do the same thing as you. To get past all the noise, you either need to build a very powerful authoritative site with great content & that can attract high-quality backlinks or you need the SEO skills to create your own backlinks. Or you need to build a personal brand like Tai Lopez. A personal brand that has great number of followers. As you can see, it can immediately seem like much more challenging path. However once you have the skill to generate free traffic, there is nothing better than auto-pilot affiliate money. I have friends that making $100K per month passively through affiliate commission. You don’t have to worry about inventory, customer service, or managing paid ads. You just let your digital assets make money for you month after month, year after year. That’s whats so good about free traffic. Once you make that youtube video or website, you don’t have to touch it again, but it will continue to generate income for you year after year. If you know what you’re doing, know how to rank these properties that you make, and you consistently make content over the long term. Then you can build a really powerful business that runs on auto-pilot. I recommend learning how to do this in local first which is what we coach our students why? because its much easier competition when ranking a site in local markets. & there’s still great money to be made in local. Also with local or affilaite marketing, You’re also dealing with more high-quality customers. When you generate free traffic, those customers found you because they were searching for you. You attracted them to you. Whereas dropshipping business, since you’re using some sort of paid advertising, its considered interruption marketing meaning you had to interrupt someone’s attention to then try & convince them that they needed a product. This causes dropshipping business to be much more unstable because a product may not stay profitable forever, there are other variables that come into play such as time of the year, current fads, trends & more that’s allowing your product to be profitable while running paid advertising. Therefore, in order to stay in the game with dropshipping long term, you really have to be in the business of continual testing, trial & error. Each time you want to try out a new product, you may have to go through the entire process again of speaking to a new manufacturer and creating a new store which can be a pain. Sometimes the juice is not worth the squeeze. Meaning for many people that’re already making 6 figures or more online with dropshipping, go into creating their own dropship coaching program because the profit margin is much bigger with an informational product plus you don’t have to worry about any customer service or processing orders. I’ve tried both businesses and was able to make money with both. If I could wave a magic wand and create a 6 figure business with either affiliate marketing or ecommerce dropshipping. I would pick affiliate marketing all day. Because an affiliate marketing business that runs on free traffic is going to be consistent income for me for years to come. I could just let it sit there, move on to a new business & it’ll continue to produce results for me. But if making money online is a brand new thing for you, then I’d say you will have a better chance at dropshipping. Earning commission on a unique platform? Try VeeSite Affiliate Program. Posted on 20/03/2019 11:22 Very nice affiliate program and dashboard!! Can we get some banners for promotion ? Posted on 20/03/2019 11:31 I am using it for two weeks and i'm recommend it to anyone who wants to make money online! Posted on 20/03/2019 11:33 Interessante blog. Posted on 20/03/2019 11:42 Als je een beetje netwerk hebt zou ik sowieso voor Affiliate Marketing gaan. Kan je serieus duizenden euro opleveren. I would choose affiliate marketing. you can earn thousands of euros with it.